Bedroom Sets- Know the Types Before You Make the Choice! Buying new furniture is the most efficient as well as stylish way to refurbish and glamorize the overall look of your house. However, in order to purchase furniture with good aesthetic appeal, fine quality, and affordable price, you first need to know about the different types of designs available for each set in the market. In our previous articles, we have been talking about basic purchasing tips that can help people buy suitable furniture for their homes. However, in this article, instead of elaborating those techniques, we are going to discuss about some basic information regarding the furniture for bedrooms instead. When you visit a store a to buy bedroom sets, the first question that the salesperson will likely ask you is the type of a bedroom set you are looking for. Therefore, in order to buy a suitable design, it is essential to know about the basic types of bedroom sets. A full bedroom set is one that comprises of five exclusive elements. These generally include a cozy bed with headstand and footrest, a dressing table with a mirror, a nightstand, and a chest. All these components have a similar design and color to complement each other and the overall aesthetics of the room. The most prevalent color for full bedroom sets is black and darker shades of brown that look elegant and add to the sublime ambiance of the room. The twin sets are one of the highly appreciated furniture sets for bedrooms. Usually, they are available in 5-piece sets that include similar pieces of that of full bedroom sets. However, there is also a larger twin bedroom set, which has two additional pieces. These complementary items are a second nightstand and an extra drawer for storage purposes. 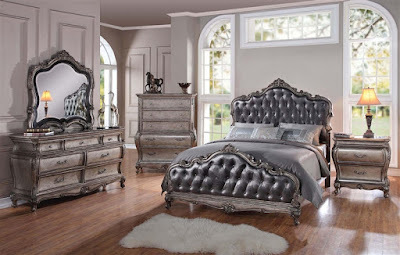 Since most of the twin bedroom sets signify antique and unique traditional designs, the hardwood pieces of the furniture usually have well defined curves and shiny polishing. Next up is the king bedroom set. These sets usually have 5 pieces, which includes a giant bed with an impressive headstand, a dresser, a mirror, a chest, and a nightstand. As the name implies, all the elements of the king set are huge, extremely comfortable, and fully reliable. Last but not the least is the queen bedroom set. The major reason of the popularity of queen sets lies in their relatively economical price. This means that within a competitive price range, customers can have a spectacularly designed bed, along with 4 other complementary pieces of furniture. Just like other bedroom sets, the beds of the queen set are also distributed into two major categories: headboard-included and headboard-excluded sets.